You can create an archive with an initial installation that overwrites all the files on the clone system, or you can create a differential archive that only overwrites the changes that are specified. For an overview of a differential archive, see Planning to Create the Flash Archive Differential Archive for an Update. After you install the master system, create a Flash Archive to use to install other systems. Boot the master system and run it in as inactive a state as possible. When possible, run the system in single-user mode. If that is not possible, shut down any applications that you want to archive and any applications that require extensive operating system resources. Oracle Solaris Operating System DVD. Oracle Solaris Software - 1 CD. An image of the Oracle Solaris Software. If you are using cd media, the image could include the Oracle Solaris Languages CDs if needed. To create the archive, use the flarcreate command. The name that you give the archive. The name you specify is the value of the content_name keyword. For a description of options, see flar Command. The path to the directory in which you want to save the archive file. If you do not specify a path, flarcreate saves the archive file in the current directory. The name of the archive file. If the archive creation is successful, the flarcreate command returns an exit code of 0. If the archive creation fails, the flarcreate command returns a nonzero exit code. Make a copy of the archive and save it. The copy can be used in the future to update a clone system with a differential archive. File systems can be copied exactly or can be customized by excluding some directories or files. You can achieve the same results by using different options. Use the options that best suit your environment. In this example, the archive is named archive1. This archive is copied exactly from the master system and then compressed. The archive is an exact duplicate of the master system and is stored in archive1.flar. To check the file structure of the archive, type the following. in this example, some individual files are greater than 4 GB. The default archiving utility, cpio, cannot handle these large files. The -L pax copy method is used to create an archive that contains large individual files. The archive is named archive1. This archive is copied exactly from the master system and then compressed. The archive is an exact duplicate of the master system and is stored in archive1.flar. In this example, the archive is named archive4. This archive is copied exactly from the master system and then compressed. The archive is an exact duplicate of the master system and is stored in archive4.flar. The -R option is used to create the archive from another directory tree. In this example, the archive is named archive3. This archive is copied exactly from the master system and then compressed. Options add descriptions to the archive-identification section, which can help you to identify the archive later. For information about keywords, their values, and formats, see Flash Archive Keywords. After the archive is created, you can access the archive identification section that contains the detailed description. An example of an archive identification section follows. In this example, the archive is named archive2. This archive is copied from the master system but is not an exact copy. The content under the /aaa directory is excluded, but the content in /aaa/bbb/ccc remains. To check the file structure of the archive, type the following. The excluded directories that include copied files appear, but only the files that were restored contain data. In this example, the archive is named archive5. This archive is copied from the master system but is not an exact copy. The content under the /aaa directory is excluded, but the content in /aaa/bbb/ccc remains. To check about the file structure of the archive, type the following. The excluded directories that include copied files appear, but only the files that were restored contain data. You can combine options -x, -y, -X and -f. In this example, options -X and -y are combined. The archive is named archive5. This archive is copied from the master system but is not an exact copy. The -Y option restores the /aaa/bbb/ccc directory. The following command produces the archive. In this example, the archive is named archive3. It is copied from the master system but is not an exact copy. The files and directories to be selected are included in filter1 file. Within the files, the directories are marked with a minus (-) or a plus (+) to indicate which files to exclude and restore. In this example, the directory /aaa is excluded with a minus and the subdirectory /aaa/bbb/ccc is restored with a plus. The filter1 file contains the following list. The following command produces the archive. To check the file structure of the archive, type the following command. The excluded directories that include copied files appear, but only the files that were restored contain data. Before creating a differential archive, you need two images to compare: an unchanged master image and an updated master image. One image is the unchanged master image that has been kept unchanged. This image was stored and needs to be accessed. The second image is the unchanged master image that is updated with minor changes. The root (/) file system is the default for the new image, but you can access this image if it has been stored elsewhere. After you have the two images, you can create a differential archive, which contains only the differences between the two images. The differential archive can then be installed on clones that were installed previously with the unchanged master image. Note - A copy of the unchanged master image must be kept protected from changes and available for mounting later. Update the unchanged master image with any of the following changes. Add support for peripheral devices on the clone system. (Optional) Create custom scripts. See Creating Customization Scripts. Deliver the unchanged master image in a mount point. If the unchanged master image is stored on an inactive boot environment, retrieve it by using the lumount command. In the following example, the inactive boot environment is named unchanged_master1. The mount point is the directory /a on the master system. If the image is stored on a clone, mount the clone by using NFS. On the master system, share the clone's root (/) file system and give the master root permissions on the clone system. # share -F nfs -o rw,root=master_system "/"
master_system is the name of the master system. On the master system, mount the clone. If you saved the image with the ufsdump command, use the ufsrestore command to retrieve a copy. For information about how to use these commands, see Chapter 26, UFS Backup and Restore Commands (Reference), in System Administration Guide: Devices and File Systems. Specifies the name that you give the archive. The archive_name you specify is the value of the content_name keyword. The name is listed in the archive-identification section. Creates a differential archive by comparing a new system image with the image that is specified by the unchanged_master_image_dir argument. By default, the new system image is root (/). You can change the default with the -R option. unchanged_master_image_dir is a directory where the unchanged system image is stored or mounted through UFS, NFS, or the lumount command. You can include and exclude some files by using the options for contents selection. For a list of options, see flar Command. Specifies the path to the directory in which you want to save the archive file. If you do not specify a path, flarcreate saves the archive file in the current directory. Specifies the name of the archive file. If the differential archive creation is successful, the flarcreate command returns an exit code of 0. If the differential archive creation fails, the flarcreate command returns a nonzero exit code. For procedures about installing an archive, see To Prepare to Install a Flash Archive With a Custom JumpStart Installation in Oracle Solaris 10 8/11 Installation Guide: Custom JumpStart and Advanced Installations. In this example, the directory for unchanged master image is named unchanged_master1. The new master image that contains changes is the root (/) directory. The new master image is compared to the unchanged master image and the resulting differential archive is then compressed. The differential archive is stored in diffarchive1.flar file. The archive contains files that are to be deleted, changed, or added when installed. In this example, the unchanged master image, unchanged_master1, is stored on an inactive boot environment and is accessed by mounting the boot environment. The new master image is the root (/) directory. The new master image is compared to the unchanged master and the resulting differential archive is then compressed. The archive is stored in diffarchive4.flar. The archive contains files that are to be deleted, changed, or added when installed. To manage system updates, you can use Live Upgrade to copy the OS, which creates a new boot environment. This copy can be compared to the master system that has been updated with minor changes. The resulting Flash Archive differential archive can then be installed on clone systems. For more information about Live Upgrade, a feature of Oracle Solaris, see Chapter 2, Live Upgrade (Overview), in Oracle Solaris 10 8/11 Installation Guide: Live Upgrade and Upgrade Planning. From the unchanged master system, create a new boot environment by using the lucreate command. This new boot environment is an exact copy of the master system and can be used to create the differential archive. Check the status of the two boot environments. Update the master image with any of the following changes. Mount the newly created boot environment. Create the differential archive by comparing the master system to the boot environment. Specifies the name that you give the archive. Creates a differential archive by comparing a new system image with the image that is specified by the new_BE_dir argument. For a list of options, see flar Command. Unmount the new boot environment. The flarcreate command returns an exit code. If the creation is successful, an exit code of 0 is returned. If a failure occurs, a nonzero exit code is returned. Install the Flash Archive differential archive by using a jumpstart profile. The clone systems that are to be installed must be a duplicate of the original master system or the installation fails. The following example profile installs a differential archive, test.diff, on the device c1t1d0s0. master_BE is the name of the current boot environment. 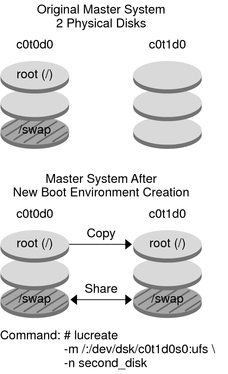 copy_BE is the name of the new boot environment. The file systems root (/) and /usr are placed on s0 and s3. The lustatus command reports that the new boot environment copy is complete. The SUNWman package is added to the master system. After the master system is updated by adding the SUNWman package, the flarcreate command creates a differential archive by comparing the changed master and the unchanged new boot environment. Install the differential archive on clone systems. For procedures about installing an archive, see To Prepare to Install a Flash Archive With a Custom JumpStart Installation in Oracle Solaris 10 8/11 Installation Guide: Custom JumpStart and Advanced Installations. The following image shows the creation of the new boot environment by using the lucreate command.